Moments ago: White House press secretary Sarah Sanders and Office of Management and Budget acting director Russell Vought took reporters' questions. Why Vought was there: President Trump is expected today to deliver his budget roadmap, which includes deep spending cuts and asks for $8.6 billion for a border wall. Six weeks, no briefing: There hadn't been a daily press briefing with Sanders since Jan. 28. Today's was the first in 42 days. Will daily W.H. press briefings make a comeback? Today's White House press briefing was the first in 42 days, and it ended the longest stretch without one under the Trump administration. On China: Sanders said there is still no date set for President Trump and Chinese President Xi Jinping to meet to finalize a trade deal — but she said the administration is "keeping everything on the table." On Trump's national emergency: Sanders insisted Trump's emergency declaration to fund the wall is within his authority. "He took an oath of office and he has a constitutional duty to protect the people of this country," she said. On Trump's comment that Democrats are "anti-Jewish": Sanders was asked — at least three times by different reporters — if President Trump truly believes that Democrats hate Jews. She refused to directly answer the question. On Michael Cohen: Sanders said Michael Cohen "lied at least twice" in his public testimony before Congress. "I think it’s time to stop giving him a platform," she said. She also wouldn't address the checks President Trump wrote to him. White House press secretary Sarah Sanders refused to address the issue of the President's checks to Michael Cohen, allegedly to refund hush money payments, instead referring reporters to the President's personal attorneys. Asked about the check Trump signed to Cohen in August 2017, Sanders said: "I’m not aware of those specific, uh, checks." Pressed further, Sanders only reiterated Trump's claim that he did not violate any campaign finance laws and referred reporters to the President's personal attorneys. "The President's been clear that there wasn’t a campaign violation ... I would refer you back to the President’s comments. That’s not something I’m a part of and I would refer you to the President’s outside counsel." Sanders also declined to say whether President Trump is indeed "Individual One," as referenced in federal court documents. "I’m not going to comment on an ongoing case," Sanders said. Michael Cohen said in his congressional testimony last month that Trump is "Individual One." 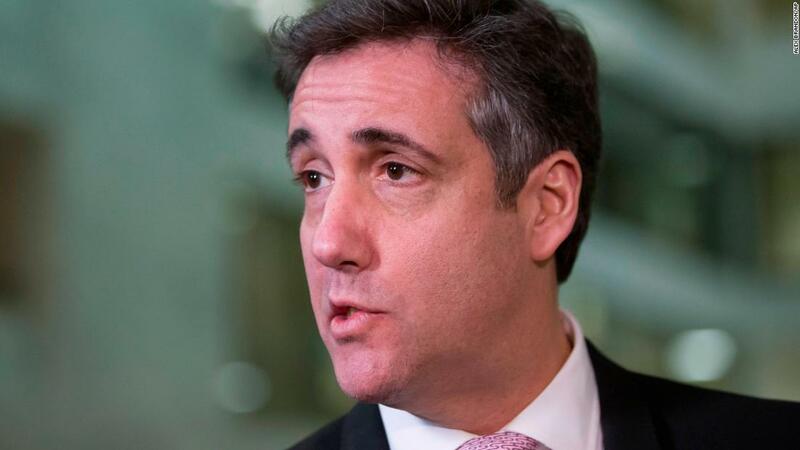 Sanders on Michael Cohen: "It's time to stop giving him a platform"
White House press secretary Sarah Sanders said Michael Cohen "lied at least twice" in his public testimony before Congress. "We know that he’s lied at least twice in that hearing," Sanders said. "I think it’s time to stop giving him a platform, let him go on and serve his time." White House press secretary Sarah Sanders was asked -- at least three times by different reporters -- if President Trump truly believes that Democrats hate Jews. The questions stem from an Axios report this weekend that disclosed he made similar remarks to donors while behind closed doors at Mar-a-Lago. "The President has laid out clearly his position on this matter. Democrats have had a number of opportunities to condemn specific comments and have refused to do that. That's a question you should ask Democrats what their position is since they're unwilling to call this what it is and call it out by name, and take action against members who have done things like this like the Republicans have done when they had the same opportunity." "You ought to ask the Democrats." White House press secretary Sarah Sanders was just asked about the looming vote in the Senate against President Trump's national emergency declaration. The Democrat-led House already passed the resolution, and it's now up for consideration in the GOP-majority Senate. Some Republicans are expected to vote in favor of the measure to stop Trump's declaration. "What is the President doing to stop a rebellion among Republican senators? We know that a rising number — it's been reported as many as 10 or 15 could vote against that — What's the President doing about that?" a reporter asked. Sanders responded by saying the President is "doing his job." She said Trump's emergency declaration addresses "a humanitarian and national security crisis at our border" and insisted he has the authority to authorize such an order. "He took an oath of office and he has a constitutional duty to protect the people of this country," Sanders said. White House press secretary Sarah Sanders said there is still no date set for President Trump and Chinese President Xi Jinping to meet to finalize a trade deal. "We're continuing negotiations with China," Sanders said, adding the administration is "keeping everything on the table." Sanders said it was "absurd" to believe that Trump is an unreliable negotiating partner because of his decision to walk away from negotiations with Kim Jong Un in Vietnam. "The President’s going to make a deal if it’s a good deal," Sanders said. "The president’s going to make sure whatever deal we get is in our best interest...and that it actually has safeguards to make sure that the Chinese follow through on whatever commitments they make." Before taking reporters' questions, White House press secretary Sarah Sanders addressed Sunday's deadly Ethiopia Airlines plane crash. She offered prayers for the families of the157 victims. "At least eight US citizens were among the victims," Sanders said. "We are working with the government of Ethiopia and Ethiopian airlines to offer all possible assistance." Office of Management and Budget Acting Director Russell Vought is at the podium defending the White House's just unveiled 2020 budget, which cuts spending across the board yet still isn't projected to balance for 15 years -- even with ambitious economic growth forecasts. Vought, confronted on Monday with President Donald Trump's campaign promise to eliminate the national debt while in office, punted the blame to Congress and former President Barack Obama. The acting director immediately knocked the Obama administration for doubling the national debt and argued that Trump came into office with "an economic recovery that was needed to put people back to work." Vought also noted that Congress did not take up Trump's non-defense spending cuts he proposed in his first two years in office that would have balanced the budget in a decade. "Congress has been ignoring the President's spending reductions for the last 2 years," Vought said. The national debt is projected to balloon to $31 trillion in 10 years under the administration's latest budget proposal. And the latest proposal would not balance the budget for 15 years. Today’s press briefing will be the first in 42 days, ending the longest period of time in the Trump White House without a briefing. The previous record was 40 days, and occurred during the government shutdown. Today's briefing will also marks only the second in the past 82 days. There was no briefing the entire month of February.